I've started developing enigma2 skin editor program, which is based on Qt5 framework and is cross-platform. It is done as an alternative to e2skinner for linux, but it is still in the alpha state. Contributions are welcome on GitLab. The windows version is available by this link. Known issues: comments in xml file are not supported! It is very nice to work on Linux .. Long time I wait some one developing that program to work on linux. Because I don't like to switch between win and Ubuntu just to use e2skinner. 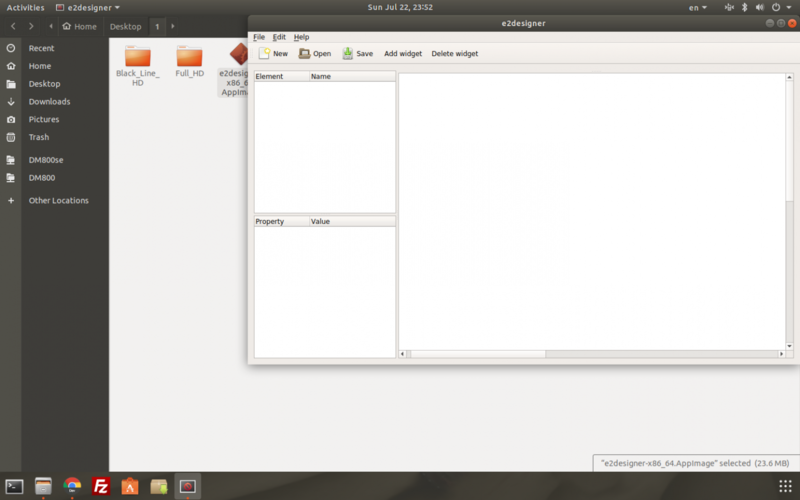 So I waiting you to release Linux version..
On linux you can build it with qmake && make. I am working now on portable binary like AppImage. Edited by technic, 21 July 2018 - 22:36. Edited by Persian Prince, 22 July 2018 - 05:14. GitLab and GitHub are almost the same thing, for you it shouldn't matter, you can register in both gits. Yes I am aware of e2skinner2 project, which I like and I used it as an inspiration for my work . I built an AppImage for linux x64 https://bintray.com/...x86_64.AppImage. How can I use it ?! I need normally software to use it on Ubuntu such as e2skinner on windows. Thank you for the interest in my program. You can read about AppImage here https://appimage.org/, it is portalble linux executable. If you want to have ubuntu ppa or deb package please contribute. Thanks for testing! Please let me know which skin did you open? font file not found ""
font file not found "lcd.ttf"
font file not found "/usr/share/enigma2/T.BLACK-FHD/fonts/DroidSans-Bold.ttf"
font file not found "ae_AlMateen.ttf"
font file not found "tuxtxt.ttf"
Thanks for your reports guys, I will look into it. Small update for these alpha builds: Now it is possible to open that skin. 1) upon save some data from skin is lost. Such as all comments and unknown tags (copyright, homepage, support). 2) Also there is some style differences between original file and xml that is produced by the application: there is extra space before xml close tag and whitespace difference in the font naming. 3) Skin resolution is always FullHD now, but we need to read it from skin.xml as well. Edited by technic, 25 July 2018 - 09:00. Okay, it loads the skin.xml just fine. I'll try editing the skin. Cool, make shure that you use the latest build from gitlab. I want to implement auto update feature later. Fonts also doesn't detected and appears . Attach the skin zip file please.